Prefer to listen to the information below? Click on the audio file and I've recorded it for you. Also, throughout the ages there have been a plethora of claims around what a gemstone will and will not do. Countless authors have surmised their opinions, intuitions, hearsay and folk-lore around the powerful energies contained in precious gems. In 1989 a book of channeled materials, Gemisphere Luminary, came out that I find has the clearest, most concise and relevant information on the energetic qualities of the top 30 therapeutic gemstones available to us today. It explains that much of the reason mixed or no results have been available to humanity through gemstones in the past is because we have been deliberately kept in the dark as to how to utilize their energies most powerfully. That by withholding this information, humanity had the opportunity to evolve itself to a point where it could responsibly use the power of gemstones, and - as a test - we are given a small amount of information to see how we will use it, and what we will do with it. Humanity has arrived at the point where a certain number of us are now ready to use the true power of gemstones to benefit ourselves and humanity. Although the information in this book was generated by a channel, it is through my own discernment as a channel that I can see the very clear and pure nature of this artist. I have been so moved by the identification of the Gemstone Guardians that I moved to Carlsbad, California to enter school and earned my Graduate Gemologist certification at the Gemological Institute of America, the most noted worldwide authority on gemstone identification and diamond grading. It is very important that stones are accurately identified, as there are so many lower quality and synthetic versions on the market today. I can also see that although the book was published by Michael Katz, I believe the power inherent in the material channeled anonymously is knowledge that belongs to us all. Gemstones are Earth's Life Force, and her gift to us to continue to do well for her and ourselves. I believe this is one of the most important roles that conscious beings have on the planet today. This is why I have taken it upon myself to become educated and certified in stone identification and learned the professional trade practices in construction and knotting of beaded necklaces. As you may be aware, much of the material coming from Spirit in the Spirit Source Connect meditations/energetic transmissions includes the energies of color. We are often FILLED with specific color, and then told of the beneficial effects of each color in the color ray spectrum. Our transmissions include blends of color, shades, hues and varying strengths and timidity. I have felt each color ray to have a very distinct personality and purpose in the world. I have recognized the white light from Source, breaking down and differentiating into the various color rays, much the same way as a prism transforms a beam of light into a spectrum of rainbow. Genuine gemstones, formed from intense heat and pressure deep in the Earth over thousands of years contain exactly these color rays in their various forms. For example, Amethyst carries the Purple ray, and the Red ray is present in Ruby, Rose Quartz, Rhodochrosite and Pink Tourmaline. It is said that the crystalline veins running through the ground are the central nervous system of Gaia, energized by her chakra system. By wearing gemstone necklaces, each of these color rays directly feeds and nourishes our own chakra system with that which was formed in the Earth in a highly magnified manner. Worn in the right form, the energy present within a single sphere of Crystal Quartz, for example has 1000 times more energy extending outward than our own bodies. Therapeutic grade gemstones - those of the highest cut, color and clarity- have the ability to create positive change in one's entire body, mind, heart and spiritual capacity. Be aware however, that gemstones of poor quality or those that have been cut in traditional ways lose their ability to uniformly receive and extend energy from Source to you. Stones that are encased in any kind of metal for example, will have much of their power constrained by that metal and will have no affect at all. So that fabulous emerald ring you got from Grandma? It may be very pretty, but will have little energetic affect on your body or your soul ;-). Try some of these. Not sure what's best for you? The Energetic Gemstone Consultation matches specific, therapeutic grade gemstones to suit your needs and goals, whether they are for your physical health and well-being, emotional growth or spiritual expansion. The school of thought followed is the recently channeled material received in Gemstone Luminary by Michael Katz. 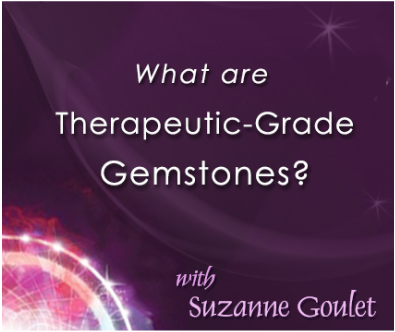 After becoming thoroughly familiar with this highly vibrational material, Suzanne enrolled and became a Graduate Gemologist, earning her Certificate at the Gemological Institute of America in Carlsbad, California. This education is vital in understanding the difference between therapeutic grade and non-therapeutic grade gemstone material. GIA is the premier educational facility for diamond and colored stone identification and grading in the world. Not all crystals and gemstones have therapeutic effect, and many can be damaging or debilitating to your energy system. Together with spiritual understanding of one's path and the technical knowledge of therapeutic grade gemstones, this consult opens the door to allow the powerfully transformational energies of the gemstones to become available to you. With Suzanne's intuitive insights, you can choose which necklace will serve you best. To read more about the consult, please see the Gemstones Consult under the Sessions tab.